YOU DESERVE TO BE WELL. Sometimes it can be quite challenging to walk the path to wellness. It can be even more challenging to walk the talk. Often, for change to happen, it requires a team effort--that means YOUR team or tribe. These are your supporters--YOUR F.A.N.S. (Friends/Family, Acquaintances, Neighbors, and Saints/Supernatural/Spirits -whoever those maybe for you). WE ALL DESERVE TO BE WELL!!! Wellness is an active process of becoming aware of and making choices toward a more successful life. Your spirit is like a seed and self-control is soil. Plant your seed in enough soil to keep it safe and nurtured from the dangers of the world but be careful not to bury it so deep that it may never sprout to see the light of life. We hear this all the time, in the news, at work and online. Interestingly, there is no universally accepted definition of wellness. There is, however, a set of common characteristics seen in most thoughtful attempts at defining a word that is not so easy to define. What we generally see is a reference to a “state of well-being,” which is vague, to say the least. Also frequently seen is a state of acceptance or satisfaction with one's present performance and conditon. Wellness is a tough word to define because it involves multidimensional states of being and describes the existence of positive health in an individual as manifested by quality of life and a sense of well-being. Many people think of "wellness" in terms of physical health only. The word invokes thoughts of nutrition, exercise, weight management, blood pressure, etc. Though physical health is one of its components, wellness, however is much more than just physical health. Wellness is a full integration of physical, mental, and spiritual well-being. It is a complex interaction that leads to a quality of life. 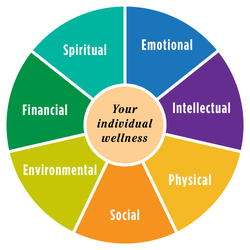 Wellness is a state of optimal well-being that is oriented toward maximizing an individual’s potential. This is a life-long process of moving towards enhancing your physical, intellectual, emotional, social, spiritual, environmental, occupational and financial well-being. Create a specific plan of action that will guide you toward your goal. Rather than "I will eat better,"try "I will have at least four servings of vegetables every day." Or, instead of "I’d like to learn something new," set a goal like "I will read at least one book every month." Keep in mind that part of emotional wellness is respecting yourself as an individual, so make your own decisions about how to improve your wellness. If you decide to change a bad habit to please someone else, chances are you will fail. Instead, it’s important to make changes when you are ready to take better care of yourself and/or to get more out of life. Be realistic by not taking on too many changes at once. Wellness habits need to be convenient and easy to fit into your life or you’ll probably give up on them. Remember that you don’t have to be perfect...just do the best you can. Wellness is a journey that continues throughout your lifetime. Each step along the way may add years to your life AND life to your years..